Kimba Buske, CMT, has been well known for her skill with deep, therapeutic bodywork using meridians and acupoints to increase the effectiveness of her detailed work. The intention is to remove all the blockages in the muscle tissue as well as get the energy flowing to leave the person feeling loose and revitalized. 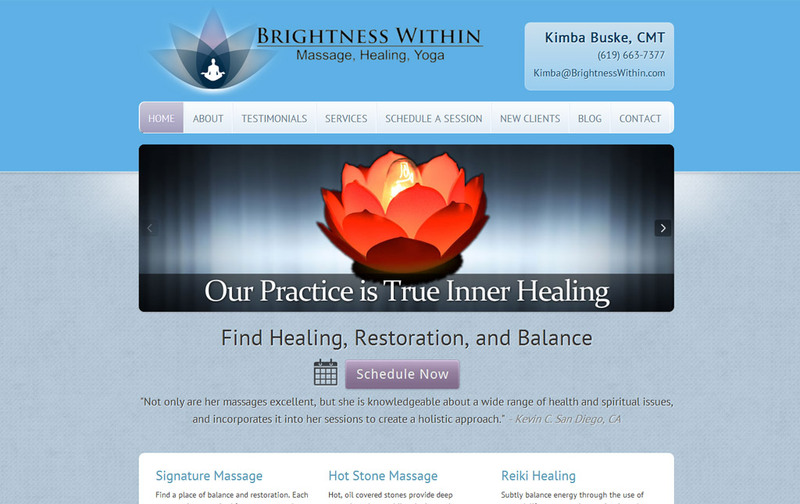 Kimba came to Design SEO Hosting to establish a presence on the web for her new massage therapy practice in San Diego, CA – Brightness Within. We worked closely with Kimba to determine the design, layout and content structure for her website based on her current service offerings and projected future growth. One important aspect of this website was for clients to be able to book services through the website, which would also keep an active online calendar of appointments for Kimba. We consulted with Kimba and found the best option was to use a 3rd party program that would integrate with WordPress. The website is not only a place where new and current clients can research information, but they can also purchase treatments, schedule sessions, email Kimba directly and keep up on the latest news via the blog. Website visitors also have the ability to connect via Facebook or read recent client testimonials.